Some adults aren’t afraid to tell you that the thought of navigating through airports and travelling alone send them into instant panic mode. But did you know that children as young as five are taking on the skies and flying solo to other parts of the world? Does that set off butterflies in your stomach? If so, you’re not alone – after all, we’ve all heard the horror stories of the children who aimlessly walk off their flights before it departs and journey miles back into town. Many parents feel this way too, but sometimes they have no other choice but to send their son or daughter unaccompanied on a flight. Thankfully, these days, most airlines have established systems in place to assist unaided children and ensure they arrive at their destination safely without stress. Before you jump the gun and book them a ticket to the grandparents’ house, here is what you need to know before sending your child on the plane. 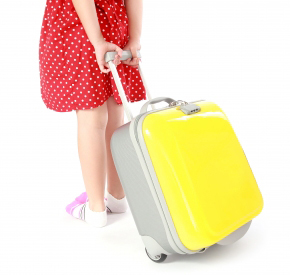 It’s common for most airlines to enforce age restrictions on children who travel alone. Those who are under the age of five are considered too young and are not allowed board a flight without a parent or guardian. Children between the ages of five and twelve can travel as long as they follow the unaccompanied minor procedures and kids aged fifteen to seventeen may travel with the option of the procedures, but it’s not required by law. Check with your intended airline as each one practices a different policy. The thought of being detained in a foreign airport due to issues with your visa or passport is scary enough for an adult let alone a child. Some countries only allow you to enter their country as long as you are within six months of your expiration date. Make sure ahead of time that all legal documents are up to date and any visas or special documents that your child may require for travelling solo are applied for in advance. If you are providing the money for your child’s trip, don’t give them a wad of cash, organise a pre-paid money card like a Travel Money Oz Passport that their guardian can take care of until they want to purchase something. Depending on age, some airline companies restrict younger children from journeying on a connecting flight. Even if it’s not necessary by the airline, safeguard your child form wandering around a large airport by booking them a non-stop trip. That way, it’s much safer and you won’t have to worry about their joining flight being delayed or cancelled. For a normal flight, you would generally arrive at the airport two hours before your flight. However, when sending your child by themselves on a plane, there are many documents to fill out before they are allowed to board. This is everything from general information about your child, to who is picking them up and their contact details, emergency contacts and formal identification. Make sure you stay at the airport until the plane has taken off just in case there is a cancellation and you have to take them back home or organise a new flight. You may be scared about letting your child flying alone, but chance are, they are probably just as scared. If this is their first flight, it’s important to inform them of everything they are likely to encounter during their travelling experience. Teach them about what behaviours to look out for and how to spot a flight attendant if they have any concerns. For safety purposes, encourage them to stay in their seat at all times with their seatbelt attached unless they need to stretch their legs or go to the bathroom. Has your child even flown alone? How did you prepare them for the flight? Tell us your story in the comments below. This entry was posted in Travel tips and tagged send child overseas, tips in sending a child abroad on December 12, 2013 by Yami.